You know how I feel about water. What does your woman do when she is bored? She does not give me a bath. But now that you have put the idea out there I am worried. Rut roh - we heard the Momster say she was really finding all this rain boring. SHE has never given us a bath - we go to the groomer's for that. Let's hope no ideas get planted here. I am absolutely allergic to the water (shower-bath and rain)! Not a bath we can assure you. Maybe take us for an extra walk. Poor you Benny. Bite the shower head we say. Treat it like a sneaky snake. Have a super Saturday. So much rain going on here in England we only need to go out for a walk to have a shower. Soon be over. be brave. I'm with Goose...now I'm worried!! OURS READS... maybe you and Lily should go on one of your shopping thingys.. and buy your mom a BUNCH of Books.. OR a KINDLE!! YES, a Kindle. THAT would be good... Get her a KINDLE beclaws she can't get that CLOSE to WATER! ANYTHINGY would be better than the WATER TORTURE!! If my woman wants to keep all her digits so that she can continue to be my assistant. Bless your heart I bet you smell good though. Oh boy...a bath! Yuck! Speaking of...Riley needs a bath. You just gave me an idea! Our mom reads blogs when she's bored. I hope my mom does not see your post! I don't like baths anymore! Is she getting your feets wet, too! Water makes you wet. Benny, that's deep! And a good reason to avoid a bath. Unless it's a mud bath. 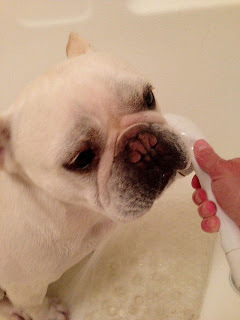 Ugh, I have a funny feeling that it is almost time for my monthly bath, too. Oh but you will feel sparkling clean and smells so good! Our woman says there aren't enough hours in the day for her, ha. Clive hates getting wet too! We tried to take a walk in the rain this morning and he was having none of it!! Hope you recovered quickly from that bath! Benny...dude you can't post about these sorta things....ssshhh...it gives Ma ideas!!! Our Lady dresses us up. We would prefer that to a bath though. Lee and Phod who hope your people find something to do soon! She tries to poke me around and squeeze my chubby cheeks! We have been busy for the past week putting up our new blog layout so we have not been able to comment! Come by and check it out when you have the chance!